ORLANDO, Fla.--(BUSINESS WIRE)--InFocus Corporation (www.infocus.com) today announces its new Mondopad Flex video collaboration system. The system features two 40-inch HD projected-capacitive touchscreens that deliver integrated video conferencing, interactive whiteboarding, presentation, annotation, and data sharing for seamless collaboration in executive offices, huddle spaces or any challenging install that requires flexibility in screen configuration. The displays can be mounted end-to-end in a horizontal array to provide a wide, cinematic presentation of shared content and video conferencing participants or mounted one above the other where wall space is limited. Easy to use directly out of the box, the feature-rich Mondopad Flex offers sleek design, bright HD displays, and the most intuitive multi-touch capabilities for any office or collaborative environment. "There's nothing more valuable than people working together. Businesses, public agencies, and schools recognize the power of video conferencing and full-spectrum collaboration with remote colleagues and are deploying it throughout their organizations," said InFocus CEO Mark Housley. "With Mondopad Flex we've created a flexible, affordable way to extend the power of conferencing and collaboration beyond the conference room -- into offices and huddle rooms -- without compromising image quality or functionality." InFocus Mondopad solutions enable teams to connect and share all types of content with local and remote audiences. Bringing the capabilities typically provided by multiple devices in traditional conference rooms, Mondopad Flex comprises two 40-inch full HD projective capacity touch-enabled screens with an HD video conferencing system, interactive whiteboard, audio conferencing, and a powerful PC. Able to perform a myriad of functions, Mondopad Flex allows team members in huddle spaces, offices or other small areas unable to accommodate a large single display to connect, see and hear colleagues anywhere. Using InFocus ConX Cloud with Mondopad Flex, teams can brainstorm on a shared whiteboard and collaboratively edit documents and draw directly onscreen, enabling real-time collaboration and more effective meetings. Documents can be saved to the Mondopad for future access, stored to the network, or emailed to anyone directly from the device. 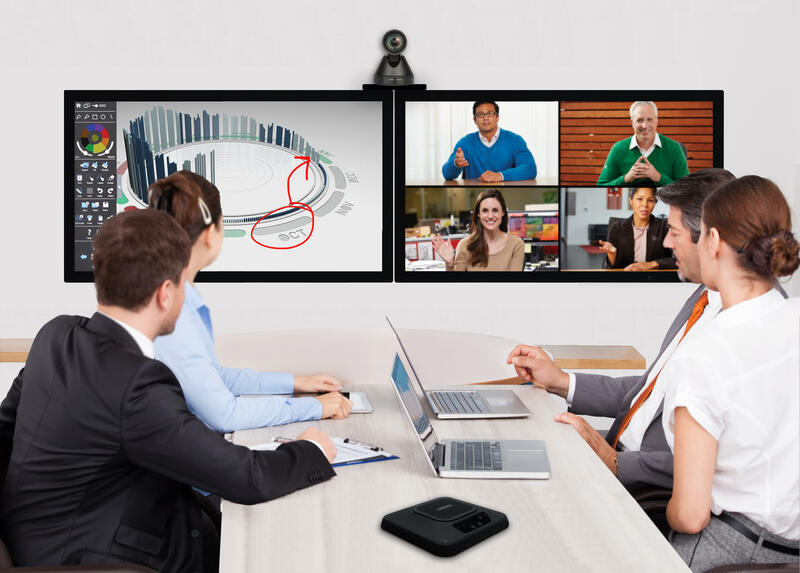 A high-quality camera and speaker facilitate enterprise-grade video conferencing even in a huddle space, making Mondopad Flex the collaboration system that connects people, devices and information easily, seamlessly and reliably directly out of the box. And because there are two screens with generous sizes, users see both data and people's faces easily and clearly. Mondopad Flex runs Microsoft Windows 10 Pro™, and features a sixth-generation Intel Core i7-6700T processor and Q170 chipset with Intel vPro™ technology, with 8 GB memory and a 256 GB solid state hard drive. The Mondopad Flex seamlessly and securely integrates into existing enterprise infrastructure and is an easy-to-configure, out-of-the-box solution. Supporting SIP and H.323, Mondopad Flex is compatible with legacy video conferencing and display hardware and software, including Skype for Business and many third-party room video conferencing systems. Advanced wireless casting, including support for AirPlay, Chrome, and Miracast, allows presenters to share content from their laptops, mobile phones, and tablets without using cables or dongles. Mondopad Flex also offers the security features native to Windows 10 Pro. As conference rooms, classrooms and collaboration environments evolve and change, Mondopad Flex offers the future-proof cross-platform and legacy compatibility institutions require, along with the installation flexibility and affordable price that permit widespread deployment. InFocus Mondopad Flex is offered at $7,999 MSRP and is available in North America only July 1, 2017. For more about InFocus and Mondopad Flex, visit: https://infocus.com/products/INF-MPFLEX-KIT. InFocus makes connecting people and ideas easy, reliable and affordable. The industry leader for more than 30 years, InFocus creates innovative collaboration solutions that support visual teamwork. Its award-winning, integrated services, hardware and software products are employed and trusted by thousands of the most successful businesses, public agencies, and schools around the world. With solutions for conference rooms, huddle rooms, office desktops, control rooms, classrooms, large venues, and people on the move, there is an InFocus product and service for every application. Learn more at www.InFocus.com. Visit the InFocus store at www.InFocusDirect.com. Follow InFocus on social media at facebook.com/InFocusCorp, linkedin.com/company/InFocus or twitter.com/InFocusCorp. \"There's nothing more valuable than people working together. Businesses, public agencies, and schools recognize the power of video conferencing and full-spectrum collaboration with remote colleagues and are deploying it throughout their organizations,\" said InFocus CEO Mark Housley. \"With Mondopad Flex we've created a flexible, affordable way to extend the power of conferencing and collaboration beyond the conference room -- into offices and huddle rooms -- without compromising image quality or functionality.\"
InFocus Mondopad Flex is offered at \$7,999 MSRP and is available in North America only July 1, 2017.